Made by hand, the 8051 is an analogue compressor with six transformer balanced audio paths, complemented by two side chains and a key input. This legendary compressor can happily take its place at any high end recording studio in the world. 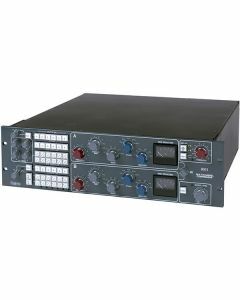 Based on six 2254 compression circuits – using the same feedback topology as Neve's legendary 33609 stereo compressor – the 8051 delivers the famous Neve sound in spades. Flexible side chain routing, trimming and filtering make this a powerful and responsive tool for surround mixing and mastering. Each channel can be controlled from either Side Chain A or Side Chain B, and the six signal paths can be split between the two side chains in any format required. Each audio channel can be routed to either or both side chains; for example the Centre channel in a 5.1 mix may be compressed using Side Chain A but also input to Side Chain B to control compression of the Surround Channels. The 8051’s compression is exceptionally smooth, and the compression remains transparent even at extreme settings. Together with the unit’s ease of use and incredible flexibility, this sound quality has made the 8051 one of the world’s most desirable units for surround mixing and mastering. Providing legendary Neve analogue sound quality without relinquishing any control, the 8051 is available as a standalone unit or can be fitted to Neve 88RS series consoles.